The following are the main stories in Tuesday’s newspapers. 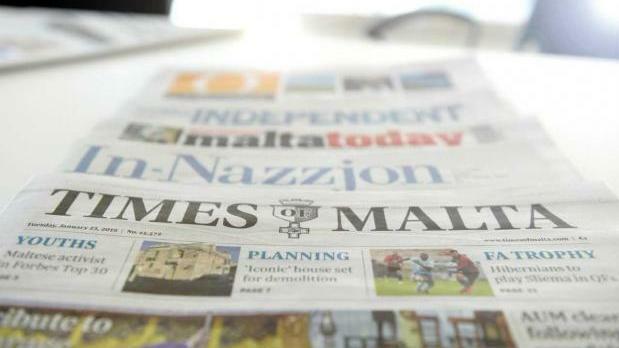 Times of Malta says that according to a Council of Europe report, there is a “notable lack of credible indications” that the Maltese authorities are diligently investigating who could have planned and commissioned the killing of Daphne Caruana Galizia. In another story, the newspaper says a new drug dubbed ‘the Trojan Horse of cancer’ has moved on to the final trial phase after proving effective against six types of cancers as part of research led by a Maltese doctor. The Malta Independent says Transport Minister Ian Borg is expected to receive the fuel stations policy review soon. L-Orizzont quotes Malta Hotels and Restaurants president Tony Zahra saying Malta should be a quality and not a mass tourism destination. In-Nazzjon leads with a meeting PN leader Adrian Delia had with the Malta Union of Teachers.